Hello Loves. Today is a very special day! 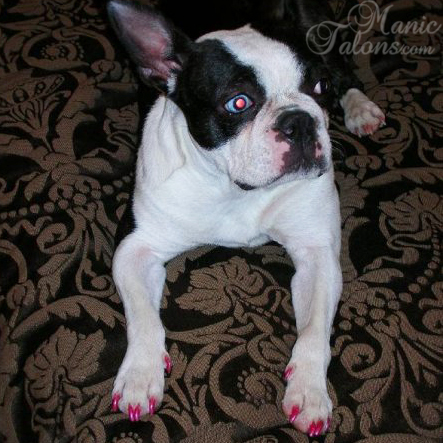 Manic Talons is officially 1 year old! When I first started this little blog, I only half expected to keep it up. And I certainly didn't expect to have so many readers. I am truly honored. I admit, I'm a stats junkie. I watch to see how many of you read my posts, and watching that number climb over the past year has really inspired me to keep pushing myself to improve my art. Thank You! Thank You! Thank You! Sometimes I need a gentle kick in the tail, and you have been here to give me one (and yes, this might be the only time anyone ever thanks you for kicking her). Before I show you what YOU have inspired, I should probably point out that I am celebrating by giving back. Yes, you read that right. I have a number of giveaways planned for September, including a full Couture Gel Polish Kit, a gift certificate to Girly Bits Cosmetics, ArstyFartsy Crafts Glitter, DIY Hard Nails, and more! Trust me, you don't want to miss them. The giveaways will be posted off schedule (not my my regular posting days), so be sure you're following through one of my many social media channels so you don't miss them. 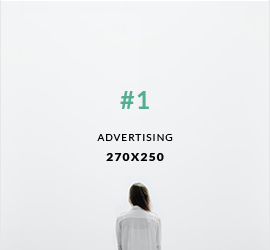 :) Hint: The first will start next week. Ok, so enough about what's coming up. Here's what I have to show you today. 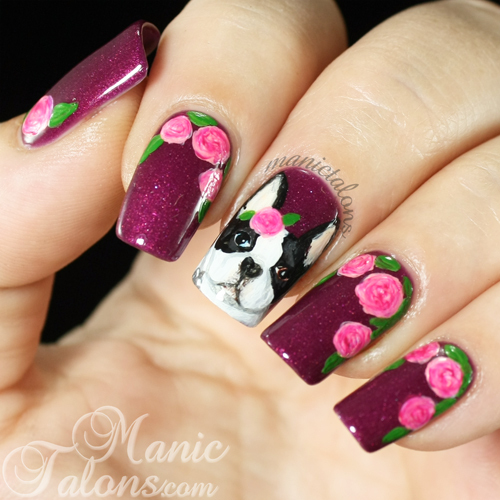 As I've mentioned a few times in the past, I have a love for Boston Terriers. Before starting our family, my husband and I volunteered with the Boston Terrier Rescue of East TN as fosters. We have had many of these bouncing balls of energy in our home over the years and continue to be ruled by three Bostons and a Chow mix. I know it's horrible to pick favorites, but everyone has that one dog who touches your heart. Annie Belle is my heart dog. She has been there for me through thick and thin, joy and sorrow, the births of my sons, the loss of loved ones...for 8 years she has been my rock. She is my little clown, my confidant, my snorting little angel. She also puts up with my special kind of crazy. 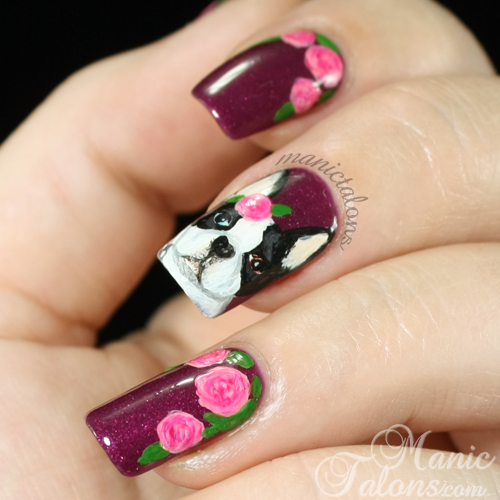 This is an old photo, but she has painted piggies so I can't resist sharing it! When I first decided to attempt nail art other than basic glitter and dots in 2012, I naturally decided to do an "Annie Mani". Want to see it? 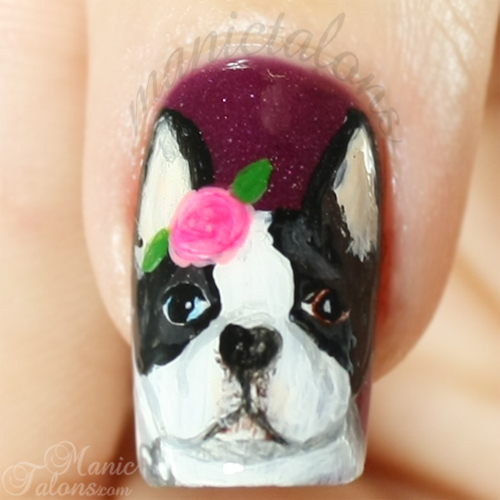 I was so proud of this bug-eyed version of a Boston Terrier, I forced it on anyone and everyone I could get to look. lol I'm pretty sure a few of my facebook friends thought I had lost my mind. I probably lost a few that day too. I don't even remember which gels I used for the Boston, but I do remember that the base was IBD Just Gel Indian Sari (it's a horribly inaccurate photo though). 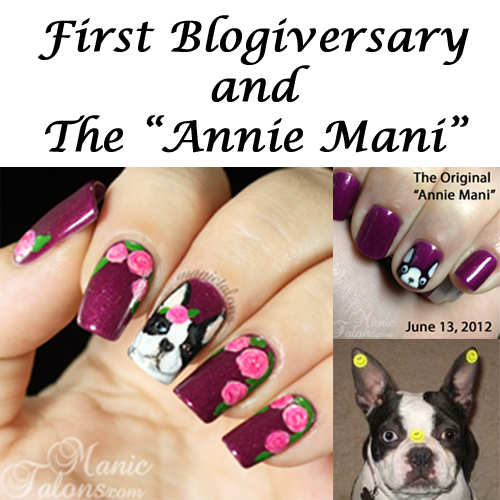 When I started thinking about what to do for my first blogiversary, it just seemed natural that I would recreate the "Annie Mani." I started with a base of IBD Just Gel Indian Sari. Then I broke out my acrylic paints and got to work. I'm tickled pink with how it turned out. See, thanks to your encouragement, my nail art skills have come a LONG way! Here's a shot with my inspiration picture. Bless her heart, Annie is such a gentle soul. She has been putting up with my shenanigans for years. lol She walked around with those stickers on her face for hours that night. I think I captured her soulful eyes quite well. What do you think? Congrats. With your skills, I can hardly believe you have only been blogging for a year. I started reading because your swatches are always among the best on google . . . My sister just lost the boston terrier she rescued 4 years ago, and that silly little girl has definitely left a hole . . .
You just blew my mind. I thought it was a decal! What? How? Just shut your face. You're amazing!!! WOW. You definitely captured Annie perfectly! It's so beautiful. (So is she btw, I can totally see why she's a favourite ;) ) Absolutely blown away by how amazing this is. You go girl! WOW! Now THAT is art!!! I just found your blog today and have been enjoying checking out your posts. Thanks for sharing your art with us. Btw, I totally understand your love of dogs (we have 2 mini doxies) and how amazing they are at putting up with us weird and crazy people. We've had ours for nearly 10 years and I love them to bits and pieces - can't really say I have a favorite because I love different things about both of them. Anyway...congratulations on your blogiversary!!! One more thing: Your nail art looks amazing far away AND up close. You captured her eyes and little snout (basically her whole face) just perfectly. 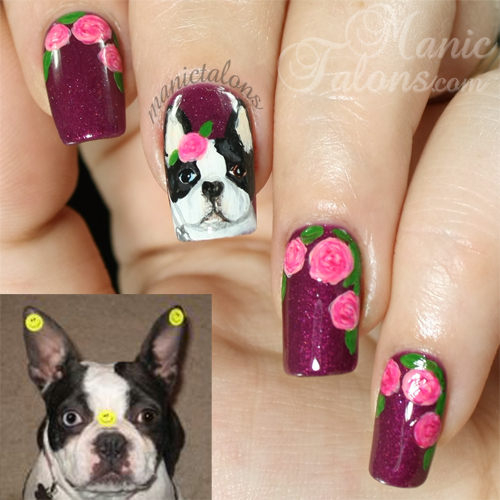 I'm blown away & can't believe you've only been doing the more advanced nail art for one year. As the saying goes - "You've come a long way, baby!" OMG awesome manicure!!!! Happy blogiversary! I want to let you know that you and Chickettes are the reason I started back doing my own gel manicures! You are definitely an inspiration to me. Thanks! Awesome. Just absolutely Awesome! I too get most of my inspiration from you and Chickettes. Please don't ever stop!.....although I could never go so far as to freehand Annie Belle. I once used fimo slices to image my two Shiba Inus and thought that was pretty snazzy!!! Pales!!! Keep up the good work and Congrats! Kiss Annie for us. I just want to start by thanking you for all of the hard work that you put into your blog! I have learned sooo much from your excellent reviews and detailed instruction! Your talent is amazing, and your work is always inspiring. 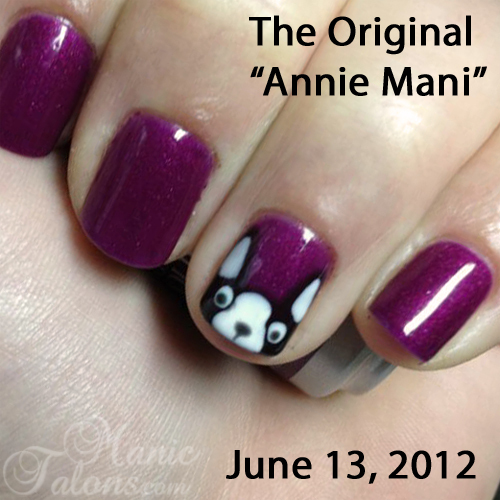 Your Annie nails are incredible! I also have a Boston and could not imagine life without him! Thanks again and Happy Blogiversary!!!!! You're so talented! You did an amazing job!